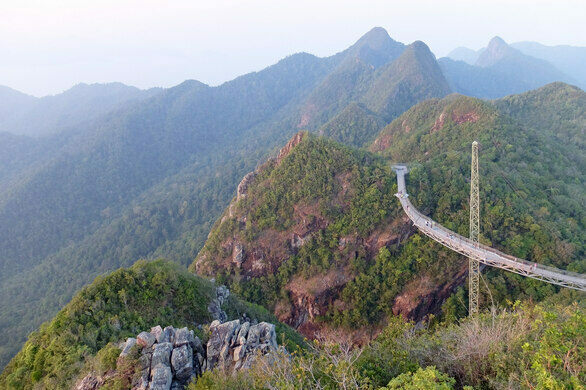 Curving wide around a forested mountain peak, the Langkawi Sky Bridge in Malaysia is an impressive feat of engineering, or so it would seem since the bridge has been closed for years with not much chance of reopening. Extravagant mosque honors modern Islam. Constructed in 2005, the steel skybridge is a pedestrian thoroughfare that allowed visitors to take a scenic stroll high above the lush forests of the Gunung Mat Chinchang mountain. After a tram ride to the foot of the bridge, the walkway winds almost leisurely around the very tips of a trio of mountains. The path is suspended over 2,000 feet above sea level by a single massive pylon that trails thick steel cables down to the bridge. The pieces of the over 400-foot bridge were lifted onto the mountain via helicopter and constructed at elevation. It looks both futuristic and almost frighteningly precarious. And as it turns out, these fears might be justified. After being open for a scant few years, it closed in 2012 for renovations and repairs. It partially reopened in February 2015 and is now fully accessible. Hikers can head to the nearby Seven Wells waterfall and hike to the summit of Gunung Mat Chinchang. It’s a tough, but easy to follow trek, that will take you between 1-3 hours one way, depending on your fitness level. The views are totally worth the struggle. There is no public transport in Langkawi and the place is quite far away (6+ miles) from the most popular areas of the island - Cenang and Kuah. So you will need either to rent a scooter, car or get a taxi.